We were headed on a standing-room only after the Warriors game on a westbound Bart train. Some soft spoken guys with equally rough and beautiful calloused hands, were talking about tomorrow’s BBQ, half English, half Tagalog. The one in the navy blue and orange thunder-era Warrior jacket offered me an open seat. I nodded and said Thanks, getting off soon. They smiled then sat down, and continued their BBQ chatter which had suddenly turned into a shopping list check-off. Standing near the door was a young couple in the twenties perhaps, exchanging that look of glittery affinity for each other. Their body language was raw and delicate, without holding hands or talking though facing each other, they seemed perfectly synchronized. If you like me, have a weak right knee that acts up past your bedtime while riding Bart or any moving public transportation dinosaur – you position your feet ready so you don’t lose balance during each stop. I find myself quite timid for certain things, but from time to time decide to go with my intuitive gut. It usually turns into somekind of story that I find myself telling my girlfriends over coffee. Or when people ask a sincere What is new? Stories are always new. Even if you repeat them, they are narrated differently. Coming off that high adrenaline after watching the basketball victorious game, I talked to her and her boots. × Nice docs. Don’t think I have seen that combination yet. × Oh, thanks! Looks like yours are pretty broken in. × Ah, yes. Long milage for sure. × Well I’d really like to break’em in good but haven’t had a chance to wear these ones exclusively, YOU know – once you wear docs, you can’t wear anything else. I have a few other pairs … she laughed. × Well said. I said. 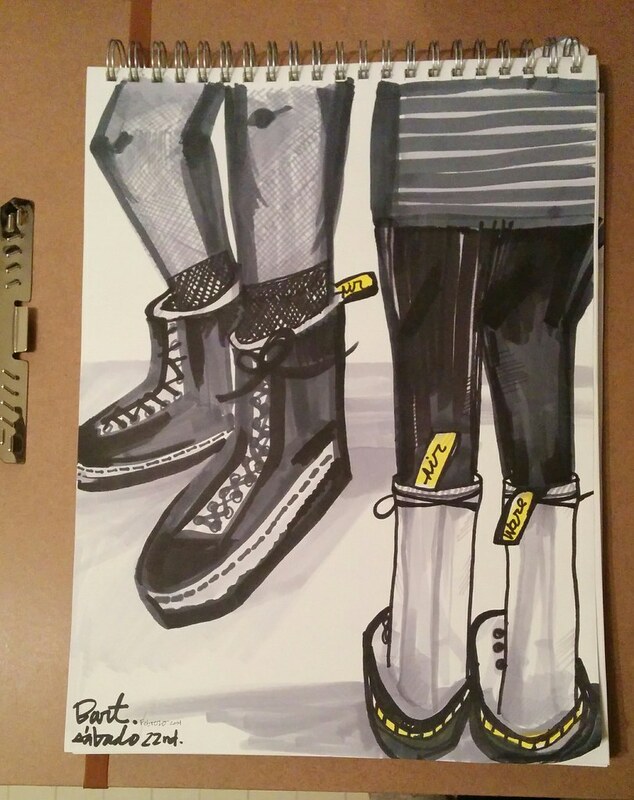 Her docs were a matte black with a white sole and a gray bottom. She smiled and waved goodbye.